That is the inescapable question. After the hoopla and security overkill of the Toyako Summit dies down, the Prime Minister and his Cabinet will be left with seven weeks of housekeeping duties and summer reading time before the start of the extraordinary session. The political classes will disperse to their home districts for seven weeks of vital constituent hand-holding and, when appropriate, backslapping—-an ominously long time for politicians to be immersed in a bath of personal and local complaints. In the absence of an election, the nation will largely put politics aside, focusing its attention on what is truly important: the Koshien high school baseball tournament--which probably will not, for demographic and wealth reasons, be won by a team from the Hokuriku, Chugoku, Shikoku or Tohoku regions. But once this idyllic summer—possibly the last summer of the LDP's era of dominance—comes to an end, the Prime Minister, his Cabinet, his party and the ruling coalition will find themselves facing a daunting question. over the determined opposition and delaying tactics of large segments of the Liberal Democratic Party, not to mention the knee-jerk opposition and delaying tactics of the majority in the House of Councillors? all while the two largest parties in the Diet do not speak to each other...the bureaucracy is demoralized and despised...and the press and intellectuals are perceived to be shabby, corruptible and narcissistic? How is it possible to change everything that must be changed--when everything that must be changed is .....everything? Aphids are highly successful insects that feed on the juices of plants. In the summer months they reproduce parthenogenetically at astonishing rates (the young are born pregnant) so that a single female can completely cover a plant source with her offspring and their multitudes of descendants in a matter of days. Despite their awesome ability to buckle down and take advantage of resources, aphids are almost defenseless and painfully slow-to-react, making them a favorite food of predators like ladybird beetles. In order to defend themselves, aphids make themselves attractive to allies. They secrete honeydew, a sweet liquid that ants love to consume. The ants, fierce warriors, then protect the aphids from marauding predators, like shepherds protecting their flocks of sheep. The akamegashiwa (Mallotus japonicus) is an extremely successful pioneering plant (it is often the first to start growing in an empty lot) with paradoxically almost no natural defenses (no spines, poisons or thick bark) -- a somewhat silly state of affairs if one is the only plant on a piece of ground. The akamegashiwa succeeds in protecting itself in the same way aphids do: it excretes a very sweet liquid from a pair of red eye-shaped structures (akame) found at the base of every leaf. Ants consume the sweet liquid and, in return, protect the plant from insect browsers. All metaphoric interpretations elucidating why I would post this information on a Japanese politics and society blog gratefully accepted. What was I saying about likely outcomes should the government cut corporate taxes, as the Nippon Keidanren has demanded the government do? That instead of expanding their businesses, increasing the size of the economy, companies would just sit on the cash instead? TOKYO --Publicly traded companies continue to improve their financial health, as seen by 654, or 41%, of them boasting more cash than interest-bearing debt as of March 31, according to a survey by Nikkei Inc.
T'is the top story of this morning's Nihon Keizai Shimbun -- that in an era of negative or near-negative interest rates over 40% of Japan's listed companies are debt-free. Let me repeat that - at a time when the cost of borrowing money is so cheap that inflation will zero out one's interest payment, leaving one responsible only for paying back the principal of the loan, 4 out of every 10 companies cannot think of a way of taking free money from lenders in order to expand their business in any meaningful sense. Talk about continuing shell-shock from the collapse of the bubble (18 years ago it happened!) - the paper describes not using leverage as being symptomatic of healthy corporate behavior (zaimu kaizen - "improving financial position" in the Japanese language original report). The article is not complimenting firms for holding down debt to a level where it is balanced out against book value, mind you. It is complimenting debt balanced out versus cash-on-hand! Please forgive me-- but given this report, the idea that cutting corporate taxes will spur economic growth is simply not credible. Anyone heard anything from Sentaku recently, the non-partisan political movement that was to reform Japanese politics from the ground up, giving people a real choice? The sheer, unadulterated greed of the corporate heavies--and the uncritical repetition of big business propaganda by their surrogates, the banking blowholes--just makes me ill.
By Keiko Ujikane and Tatsuo Ito -- June 23 -- Japan's government may signal it will consider cutting corporate taxes in an effort to encourage more foreign investment into an economy expected to grow at the slowest pace in five years this year. The government will review corporate taxes to help cut business costs, according to a draft of its economic and fiscal policy released last week. The final 2008 policy will probably be submitted to Prime Minister Yasuo Fukuda's Cabinet this month. "The government recognizes the need to cut corporate tax to help improve Japan's competitiveness,'' said Mamoru Yamazaki, chief Japan economist at RBS Securities in Tokyo. "It will be tough to get public support because a company tax cut would reduce revenue and require increasing sales or income tax.'" Fukuda's first economic policy statement as prime minister comes as foreign investors urge Japan allow more foreign investment. European Union Trade CommissionerPeter Mandelson said in April that Japan is the developed world's "most closed'' market and needs to allow more investment from abroad. The draft said the government will maintain its goal of balancing the budget by 2011, so that it can start reducing the public debt, which the Organization for Economic Cooperation and Development estimates stands at 182 percent of gross domestic product. To achieve this, the government needs to cut spending or find a way to increase revenue to fund social welfare costs. Heizo Takenaka, economy minister under former Prime Minister Junichiro Koizumi, said in May that the government should lower corporate taxes by 10 to 15 percentage points to revitalize growth. Japan's effective corporate tax rate, which includes national and regional corporate taxes, is 40.7 percent, compared with 29.8 percent in Germany, 28 percent in the U.K., and 25 percent in China, according to the Finance Ministry. A 5 percentage-point cut in Japan's corporate taxes would increase foreign direct investment by 12.7 percent in a year and add about 3.8 trillion yen to the economy over six years, according to Dai-Ichi Life Research Institute. Now I know this is a wire service report so I should not be too hard on its authors for sacrificing depth for breadth and speed. Nevertheless, the report is purportedly trying to provide context, analysis and background to a major policy proposal. If that is the goal, why do they offer only one side of the coin? "Lowering corporate taxes may increase foreign investment"
Do the social scientists at Dai-Ichi Life Institute really believe that Japan fails to attract foreign investment because its corporate tax rate is too high? Might these not have a slightly more significant impact on the investment decisions of foreigners than Japan's effective tax rate--whatever that might mean? It was the discriminatory issues, not the tax rate, that Peter Mandelson was railing against, right? "Lowering the corporate tax rate will increase growth"
By what mechanism? If the corporations reporting a profit (fools!) are granted an opportunity to pay less in corporate tax, what exactly will they do with this extra money? - pay their workers a lot more? - cut the prices they charge to consumers? - increase their dividends or buy back stock from investors? - investment in more plant and equipment? If the corporations do any of the above acts, Takenaka will be right and the lost government revenues will at least make their way right back into the broader economy. However, the chances of any of the above happening are not particularly high (Is there a profitable Japanese corporation anywhere that is suffering from a lack of cap ex?). So where will the money go instead? All of which have tended to have a contractionary effect on the broader economy, sucking liquidity and leverage out of the system. What is infuriating is that the authors fail to highlight the systemic or public policy antecedents of the current corporate tax rate. Instead, in what is a thin veneer of analysis, the authors look at the politics of a corporate tax cut--a subject so self-evident that a log could do it. "Cut corporate taxes at a time when the ruling party is talking about raising the consumption tax (a measure which, according to this morning's headlines, the PM is having some second thoughts about) and when the elderly are livid at having their pensions docked for medical insurance. Hmmm...might be a tad difficult..."
Financial news has a categorical imperative to promote unbridled capitalism and its tenets, fine. Nevertheless, if a journalist is reporting on the political economy in Japan, he or she really has to know something about the political economy of Japan. Or find someone who does. Was there anyone not the paid shill of Big Finance whom the authors might have consulted on a matter of public policy -- how the are tradeoffs are achieved and social policy goals might affect choices? You know, like a professor of public policy? Because just asking bankers and econ professors about what in their professional judgment would be best for the sliver of Japan they live in will promote a twisted view of Japanese government policy. Later - I see that D over at Japan Lost, reading the same story, beat me to the punch on voicing his skepticism of the political feasibility of a corporate tax cut. Japanese politics is like politics in other advanced, media-drenched societies: a daily dose of nonsense and puffery, effrontery and speculation, tempests-in-teacups posturing and sputtering flaring-ups. Both the Liberal Democratic Party and the Democratic Party of Japan have internal divisions as deep and raw as the divisions between the two parties. In economics each party has its cabal of liberal internationalists, its conservative pro-big business autarkists and its maudlin semi- or full socialists. In international relations, there are big nation internationalists, small nation internationalists, big power enthusiasts and semi-isolationists. In social policy there are Europhile social democrats, American-style neo-libertarians and Meiji State nativists. The problem is not the breadth of the ideological spectrum in each party, however: a national, broad-based party must necessarily have a multiplicity of political drivers inside it. Nagata-chō's problem is that for every issue the membership of the Diet is divided into multiple ideological camps, each of which has fewer than 50% of the Diet as its members. Most commentators speak of realignment (saihen) as being inevitable, yet no one group holds a majority or even a dominant position. Former Prime Minister Koizumi Jun'ichirō managed to cobble together a dominant position within the LDP by convincing both economic liberals and nationalist-chauvinist elements that he was their champion. Abe Shinzō and Fukuda Yasuo have not been able to perform a similar trick—to the detriment of their party's unity, electoral chances and ability to stare down the DPJ. Since no ideological group can dominate, the basic instinct of the political classes is to postpone the inevitable. "The Study Group Rush" as the Nihon Keizai Shimbun calls it, the sudden explosion in the number of single issue groups with memberships that cross factional and party boundaries, is symptomatic of a constipated political system. Ideology has become a hobby one pursues as a private diversion with like-minded other members of the Diet outside of chambers. Inside the Diet chambers, with rare, inevitably unprincipled exceptions, Diet members are biding their time, voting the party line. Everyone knows that if the Democratic Party of Japan manages to seize power in the next election -- a long shot possibility -- the Liberal Democratic Party will blow apart. Every LDP member also knows that if he or she jumps the gun, leaving the party now to run as an independent, he or she would be committing electoral suicide. Against a Democratic Party challenger, the escapee from the LDP will go unto his or her personal Waterloo. So everyone in the ruling coalition is sitting, head bowed, looking at the back of his or her hands, waiting for the next election. In a representative democracy, dishonesty and gross bigotry can prevail in the short run. In the long run, however, the parties and individual politicians will tend to fall into a default position of honesty and liberal rule - as hypocrisies are exposed and unsound policies blow up in faces of their authors, dishonesty become a high maintenance, energy-sapping stance. However, in an unrepresentative democracy, lies and unsound policies take on lives of their own, their existences prolonged beyond all standard measures of usefulness by the support of privileged interest groups. Japan is one such unrepresentative democracy, where the parceling out of representation in the Diet reflects the population distributions of 40 years ago--or even earlier. Diet members and their districts live in anachronistic symbiotic relationships, the Diet member delivering largesse to clients in the diminished bailiwick and these clients delivering in return their supercharged votes. Any individual or party wishing to interrupt the cycle of elections and budget allocations must either restructure the system or supersede it. Since sitting Diet members control the rules under which their own districts are drawn and oversee the redistricting procedure, remedies to electoral inequality have, rather unsurprisingly, not been forthcoming. If this is the case, then the only path to electoral success is to tailor one's every utterance and action to surpassing your opponent in flattering the over-represented voter. Tobias Harris has written eloquently and in admirable detail about the Democratic Party's ongoing struggle over how far it should go in pandering to the voters in rural areas. I would differ with Mr. Harris's depiction of the situation only in his assessment of Maehara Seiji's rebellion. Mr. Harris sees Maehara's denunciation of his party's making impossible-to-keep promises as a misguided attachment to principles. I would condemn it more forcefully as plain vanilla stupidity: Maehara is attacking DPJ Party Leader Ozawa Ichirō for the crime of trying to make the system work to the advantage of Democratic Party of Japan. Maehara is taking aim at the wrong target and in the wrong sequence. The problem is the system, not Ozawa. That Ozawa is lying through his teeth, cozying up to the most irresponsible of fiscal inanities, is a function of the game board on which he must play. In order to win enough seats to topple the ruling coalition the DPJ has to beat the LDP at its own game in the rural districts. Actually keeping any of the promises made to the LDP's clients is a problem for the future, not now. The DPJ must outbid the LDP, seize power, then blow off the rural districts -- in that order. So for the foreseeable future it may be hard to see the difference between the white hats and the black hats. All members of the political order will be lying, lying, lying and then lying some more. No surprise here -- the system rewards those able to pull off the most dishonest, two-faced, logically inconsistent performance possible. Just who is who -- and who won -- will only be clear after the election, as the victors take to the acts of governing and crafting legislation. So it might be good to forget what is in the manifestos for a while. Over at Global Talk 21 Okumura Jun has already noted the stunner of the afternoon: The Yomiuri Shimbun's claim that the deal announced this week to jointly develop a bloc of potential gas/oil producing seabed in the East China Sea has been cancelled (What? Already? Before the first round of fistcuffs?). According to the article drilling in the joint development zone would be too provocative toward South Korea for the same reason that Japan sees the Shirakaba platform to be a provocation--the cross-line sucking out of hydrocarbons from under an area of abyssal mud the South Koreans say is theirs. So, no sea of peace and prosperity aside from the Shirakaba platform investment promise -- this de re Yomiuri. Now behind all this frou-frou, brouhaha and frantic handwaving is a deadline. Signatories to the Convention of the Law of the Sea have until May 2009 to delimit the extent of their continental shelves. Chinese and Japanese interests are of course not served by this international deadline: the matter of seabed sovereignty in the East China Sea is just too sensitive. Later - Whola! Ouch! Reading only the first paragraphs of an article and then the last sentence without reading the middle can get you into trouble. The joint development plan is not cancelled--just plans for joint development of the Asunaro field for the reasons stated above. The joint development area inside of the Japanese side of the median line is still on the table. Bad MTC, trusting concluding paragraphs of Yomiuri articles without verifying! The "Vox Populi, Vox Dei" column in The Asahi Shimbun is usually so fey and detached from reality as to be a waste of good newsprint and web time. For some reason, I chose to read the International Herald Tribune's translation of column on Wednesday. Perhaps it was the ominous title. In reading the essay, I learned the sad news that the movement for a more realistic and environmentally sound way of revitalizing rural economies suffered a big loss on Saturday. A single red tram travels along a railway line through green rice paddies under a blue sky. This bucolic image is what many people conjure when picturing life in a farming village. The Kurihara Denen Tetsudo, which crossed northern Miyagi Prefecture from east and west, was one such scenic railway. To the dismay of railway buffs and residents alike, the "Kuriden" was forced to end its nearly 90-year history a year ago this spring. The site for The Railway Museum is here. I have not been to it yet (I visited its predecessor in Suidobashi once). It must be amazing. It certainly is big: the museum's gleeming white slug-like form is visible from even the most distant mountaintops surrounding the northern Kantō Plain. I do not know anything about Yayoi-san. I only know that the number of leaders of working on organic community revival is too small. The country cannot afford to lose any of them. Ironic, yes, that they should be killed by the landscape they were trying to save. I learned something today I did not know. You may not know it either. You may have heard that individuals on the island of Taiwan responded to the sinking, which resulted in no casualties or injuries, in a rather entertaining, if also worryingly belligerent fashion. You may have also heard that the president of Taiwan, while not relinquishing a centimeter on Taiwan's claim upon the islets, sought to calm the waters, so to speak. The Yomiuri Shimbun has opined that the maritime maneuvering over the Senkakus is the result of the Taiwanese president's need to switch to an anti-Japanese stance after a decline in his government's popularity. What I have learned is that it is a bit more complicated than that: President Ma Ying-jeou fancies himself to be something of an expert on the legal status of the Senkakus. President Ma Ying-jeou is an expert on the legal status of the Senkakus . He will be hard to push around or fool, I am afraid. Huge hat tip to Michael Turton of The View from Taiwan. Questioner: "Though it is my understanding that there have been many gas fields discovered on or around the mid-point line, why are Shirakaba and Asunaro the only fields mentioned? Why are the others not mentioned? In addition, the deputy spokesperson of the Chinese Ministry of Foreign Affairs yesterday declared that Shirakaba is inside China's area of sovereignty and it has no relationship to any 'joint development.' What are your thoughts on this? As for remaining areas (of dispute) that is for continuing negotiations. As for the Chinese declaration that 'This is not joint development,' I would like to say that this is a matter of definition. If the Chinese are saying 'This is not joint development,' I have no intention of filing a protest, saying 'No, no you are wrong.' At the end of the day, we come away from this winners -- with a committed investment by a Japanese corporation in an area on the Chinese side of the midline that the Chinese have already developed. Whether you want to call it 'joint development' or not call it 'joint development' -- I really don't care either way." So cold, so smooth, so contemptuous. You have a lawyer as foreign minister. Be happy. Later - Here is the transcript of the press conference. Quietly, and without any fuss, Fukuda Yasuo has appointed a Minister for Space. and Promotion of Administrative Reform for Consumers (I am not making this list up) Kishida Fumio -- who clearly has too few responsibilities, was named Minister for Space Development (Uchū Kaihatsu Tantō Tokumei Daijin) yesterday. I wish Minister Kishida and his meishi printer my best. Speaking of space, this is hilarious...and a neat demonstration of little-appreciated aspect of zero gravity life. The niggling matter of not working out the consequences of increased distances between two points reminds me of the disaster a few years back when JR East decided to raise the section of the Chuō Line running through Kan Naoto's district (of all districts, it would have to be Kan's district, wouldn't it?). Engineers forgot to calculate how long it would take to cross the railroads tracks if the distance between the fumikiri gates was doubled. Hint - it takes about twice as long. It was only by sheerest luck that nobody got killed. Later - I see the Australians are keeping up with developments. In the spirit not at all related to current events in California, do you Hu Jintao take Fukuda Yasuo to be your lifelong partner in oil & gas development? TOKYO (AFP) - Japan and China agreed Wednesday to jointly develop a disputed gas field in the East China Sea, resolving a longstanding row between the Asian powers, a Japanese foreign ministry statement said. Japanese companies will participate in the existing development of the Chunxiao gas field, which Japan calls Shirakaba, a statement said. Okumura Jun has written at length and with erudition about his fears regarding the agreement's inviting speculation that Japan is not willing to defend its full claim to the seabed in between the geographic mid-point line and the Okinawa Trough. My view on the agreement is more sanguine and two-fold. First, in terms of the conduct of international affairs, China has had a history of losing to Japan whenever the two sides argued about sovereignty over a bit of territory. I could understand a Chinese wish to hold border talks with everybody except the Japanese, preferring to handle those boundary disputes through a hearkening back to the Edo Period practice of keeping the line between the Sinitic and Nipponic spheres vague...rather than revisiting the chain of conflicts from the 1874 Japanese invasion of Taiwan onwards--fights that erupted largely from the early Meiji government's ingesting wholesale the praxis associated with the Westphalian state system. Dignity and empty sack is worth the sack. Japan gets the chance to call the East China seabed its own without fighting a shooting war with the Chinese over it, the possibility of linking up with the Chinese pipeline network and a share in an existing platform. Most of the canonical Ferengi Rules of Acquisition can be found here. The story bringing this whole post full circle is here. Is it not great that they are of two minds, literally? (May 29, 2008) - The U.S.-Japan alliance has been the indispensable anchor of peace, prosperity and freedom in the Asia-Pacific for more than 60 years, and its importance will only grow in the years ahead. Deepening cooperation, consultation and coordination between Washington and Tokyo is the key to meeting the collective challenges that both of our nations face--from nuclear proliferation to climate change--and to advancing our common interest in building a safer, better world for all of our citizens. (May 29, 2008) - The next President of the United States will face an array of challenges and responsibilities in the world, including the need to protect America and our allies from the threats of terrorism and proliferation, keep international markets open and vibrant, and advance the universal values that underpin our common security and prosperity. We firmly believe that strengthening and expanding America's close partnership with the Republic of Korea is a critical to accomplishing all of these goals. Why did the respective ghostwriters of these two essays, published on the same exact day, not at least agree to have different titles? Or do Japan hands not talk directly to South Korea hands, and vice versa? Maybe it is me, but the overall effect makes the essays a little less "special" than purported. It is also amazing how self-congratulatory the rhetoric in these two essays sounds--and how dated, even though the pieces are ostensibly only a little more than two weeks old. Later - All of which gives me the opportunity to link to this short, palm-of-the-hand analysis by Weston Konishi. ...which would allow me to segueway to introduce a new East Asia blog produced by the Bruces and Sheilas of ANU's East Asia Bureau of Economic Research. ...which allows me to link to Tobias Harris's review of RAND scholar William Overholt's clear-eyed, anti-revisionist report on the political position of the United States of America in East Asia. Former Prime Minister Abe Shinzō and Nakagawa Shōichi in particular were having a great week. On Wednesday, the Supreme Court invalidated a lower court decision forcing NHK to pay damages to the co-producers of a program on a mock war trial of the Showa Emperor. The "verdict" of the mock war trial was cut from the program after Abe and Nakagawa made a secret trip to NHK headquarters and demanded that the program be altered—and that a discussion forum featuring critics blasting program be appended to the broadcast. Now the Tokyo High Court (the real court, not the mock trial) based its damages award decision on the assumed existence of peculiar right, the kitaiken -- the "right of expectations." In the view of the High Court, the NPOs who had co-produced the program had the right to expect that the point of the program would not be altered and furthermore that NHK would not bow to political pressure and broadcast, immediately after the co-production, a discussion program debunking the premise of the co-production. As far as I can glean from news reports, the Supreme Court ruled that the constitutionally-guaranteed the freedom of the press precludes the existence of a "right of expectations" – that as a member of the press NHK had the right to use or not use the footage as it saw fit. So the press in Japan can rest easy, knowing it has the complete freedom...to alter or suppress its own product in any way demanded by any powerful individual or sinister force. Call it the muchōhetsuraiken – "the right of gutless sycophancy." It is a right, yea a basic freedom that all hold dear...and which clearly needs a Supreme Court's protection. Later - In a gymnastic editorial on the Supreme Court's decision, The Asahi Shimbun provides a stirring example of muchōhetsuraiken in action. In my heart of hearts, I believe the DPRK government was not lying in September 2002. One way or another, eight of the 13 Japanese citizens believed kidnapped by North Korean agents in the 1970s died long ago. Intellectually, I can accept the possibility that one or two may still be alive, either in a reeducation camp or a mental facility. However, my heart tells me it is unlikely to be so. I am also not sure whether or not the DPRK turned over the remains of Yokota Megumi. However, I am fairly sure that running DNA tests on cremated bits of bone and ash was a futile exercise (hence my problems with this report). 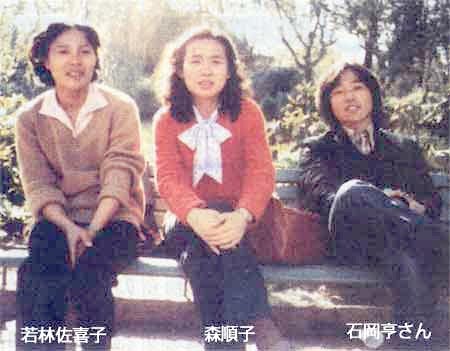 Ever since Kim Jong-il tossed caution to the winds and not only confessed to the kidnappings but also, incomprehensibly, let the kidnapped and their families leave the DPRK (the marked, inexcusable exception being the daughter of Yokota Megumi, of course) the families and their ultra-right defenders have been overstaying their welcome as the nation's official sufferers-in-chief. The Japanese government's shift to a hardline, intransigent stance over the abductees crippled efforts to rein in the DPRK's nuclear program--with predictable results. A reopened investigation into the fates of the abductees holds risks. At best, it will not find much in addition to what has already presented. At worst, new information will be "discovered," the facts of which will likely be so awful as to send the relationship spiraling back into the abyss. The "reinvestigation-for-loosened-sactions" deal is nevertheless a good start -- one that perhaps only a deeply wounded Fukuda Administration could have ever accepted. 2) their spouses who lured Ishioka Tōru (yes, it's the mind-bending Spain photo) and Arimoto Keiko to their doom. Apart from the still-at-large perpetrators of the 20 March 1995 Sarin gas attack on Tokyo's subway system (oh where oh where did they go?) the Yodo hijackers plus Mori Junko and Wakabayashi Sakiko are the National Police Agency's most wanted criminals. There is nothing the NPA would love so much as the chance to put them all behind bars for the rest of their natural lives. That there is serious talk about the DPRK and Japan cutting a deal over the Yodo hijackers demonstrates that both sides are willing to place huge bets on the future. And that is a very, very interesting development indeed. 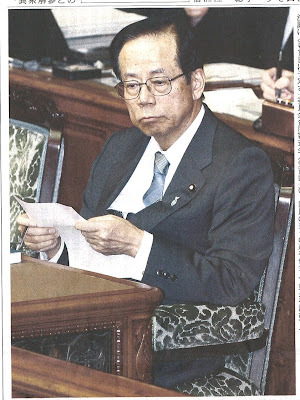 Big, bad, brassy and bold, the hard right Sankei Shimbun delivers via a huge, tremendously flattering photo on its front page today, the editorial board's opinion of the inspiring vigor of the administration of Prime Minister Fukuda Yasuo, post-censure motion. "Psst, ya wanna know a I secret? I kinda hate this job." W. David Marx goes on a search for the origins of a luxury goods talking point and finds gold. Japanese swimmers will be allowed to wear cutting-edge swimsuits made by UK-based firm Speedo at the Beijing Olympics, officials have said. The decision is a U-turn on a previous ruling that allowed only Japanese makes of swimwear to be used. TOKYO, June 10 - Japan's main opposition party plans to submit a non-binding censure motion against Prime Minister Yasuo Fukuda in parliament on Wednesday in a bid to pile pressure on a leader whose public popularity has plunged. The censure, likely to be adopted as opposition parties control the upper house, would be the first against a prime minister under a constitution drawn up over 60 years ago. While embarrassing, it will not oblige him to resign or call an election. 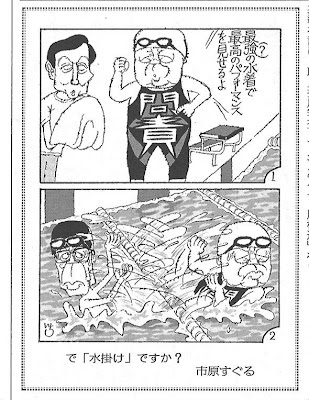 Wearing a Speedo LZR suit with the word censure (monseki) on it, Democratic Party leader Ozawa Ichirō swears to his towel boy, DPJ #2 Hatoyama Yukio, "With this, the world's best performing suit on, I will show everyone my best performance!" At which point rather than race each other, Ozawa and Prime Minister Fukuda Yasuo engage in a childish splash fight across the lane barriers. My memory may be faulty but "performance" (pafōmansu) seems to have had interesting trajectory as a loan word. My impression is that it was originally borrowed from Business English and was used in a straightforward way, such as for "high performance" computing. It is now more commonly used in sarcastic double talk, playing with the alternate English meaning of performance (as in "putting on a performance")--so that a word that once indicated a well-directed focus on achievement is now used almost exclusively to mean the exact opposite: a pointless, content-free show. One for the philologists and behavioral linguists. Former Prime Minister Koizumi Jun'ichirō, watching the towers of the World Trade Center fall, understood in an instant that the terms of the Japan-U.S. alliance had been reset. Whatever the Cabinet Legislative Bureau had ever said was or was not constitutional vis-a-vis the use of the Self Defense Forces in service of the alliance was no longer operative. And Koizumi set about realigning the policies of Japan with the new reality. Do the various interested parties in the United States understand that the Koizumi shift was conditional, not ideological--and that events since the Afghan War--the new, new reality-- have been resetting the terms of the alliance again? I sure hope they have. b) its direct participation in international security operations. One longtime dove argument against such an increase in military capabilities and/or commitment to international security cooperation has been that, in the context of a dependent Japanese alliance with the United States, a more militarily capable Japan would find itself with paradoxically less autonomy than before -- that due to the SDF's greater usefulness, Japan would get dragged into U.S. military adventures. "Are you saying that you worry that the United States, Japan's ultimate protector, would engage in illegitimate, security-diminishing military adventurism, unthinkingly sacrifice its own blood and treasure, and the blood and treasure of its allies? I' m sorry but you are barking up the wrong tree. The United States is not pre-1945 Japan, sending its soldiers into country after country, chasing after some ever-receding horizon of ultimate security!" An aside - I hope that the recent mania, particularly the U.S. media's cooperation in the suppression of dissenting views--and the willingness of U.S. elites to surrender their skepticism over a preemptive, non-UN sanctioned invasion of a sovereign nation and the establishment of an intrusive, corner-cutting, torturing, secret police state at home -- finally lets the pre-war citizens of Japan off the war-responsibility hook. Considering what few institutional supports and what little leverage Japanese citizens had under the Meiji Constitution, their record in defense of their freedoms and against the propaganda of the militarists turns out not to have been so poor after all. "How could they let this happen? Was there no one to say 'Stop'? Was there some cultural predilection to obedience that made them give up their rights and succumb to war fever?" The answers turn out to be, in order, "Easily," "No" and "No." Since it turns out that the United States can gin itself into a war fever and drag its allies into a murky, blood-soaked adventure without clear endpoint or purpose, have we come to a juncture where purported Japanese foot-dragging and self-limitation on security cooperation no longer looks irresponsible but instead looks prudent? Where Japan's emphasis on contributing to world security through leadership on disease control, global warming, combatting poverty...and Japan's basic acceptance of the sovereignty of all nations...has stopped looking merely smart but indeed begins to look...moral? And do the "Japan specialists" advising the two candidates for the U.S. presidency understand that a post-Iraq, post-Abu Ghraib (and many other things too) Japan-U.S. alliance has the two allies on a different footing than before? I see evidence of an awareness of the shift--but I do not see an acceptance of it. ....but they sure are not telling much. NHK nightly news just broadcast the result of their new weekend survey. As I expected, appearing to pass legislation and engaging in the everyday activities of governing is pulling the Cabinet's support levels up off the floor. At least it gets some of the public's eye off the Cabinet's less attractive features. The Cabinet's support rating rose 5% from last month's 21% to 26%, while the disapproval rating sank 5% from 66% to 61%. Even with the improvement, however, these are still incredibly bad numbers for the Prime Minister. Asked how the Prime Minister should respond to the passage of a censure motion by the House of Councillors, 49% said that Prime Minister Fukuda should dissolve the Diet and have an election. Another 11% said he should simply resign. Only 30% said he should continue as he has been doing. Asked what kind of government would be ideal after a general election, 23% answered "a grand coalition," but nearly identical percentages wished for an LDP-dominated (22%) or a DPJ-dominated (22%) coalition government. In straight, one party-only government, a DPJ-only government had twice the support (11%) as an LDP-only (6%) government. When asked when the PM should hold an election, given the need for one, the plurality (38%) said, "After the Toyako summit, in the fall." The second choice, though, that of 26% of those polled, was "in the fall of 2009, at the end of the House of Representatives term." Only a very few of those polled wanted an election ASAP. Asked which party they support, 33% said the LDP (up 3%) and 26% said the DPJ (down 4%). What? Maybe it is a margin-of-error thing. As for the over-75 eldercare system, 52% of respondents said they supported it but thought it should be reformed. 35% thought it shoud be rescinded. Only 7% (?) thought it should be left as is. But then the weirdness started. 59% -- exactly the same number -- of those polled said yes. As a political wedge issue, the eldercare insurance system seems to be a wash. So the public as interviewed by NHK is pretty much evenly split on policy and political orientation. However, the voters like neither the PM nor the current Diet. Later - Now that NHK has some of the numbers up, I have made some adjustments and additions. For good and ill, Japanese emergency medical personnel have very little experience in treating weapons trauma victims. Later - I stand corrected as to the incident in question. Two of the physicians responding to the emergency were specialists from the country's top emergency response medical corps. What time they arrived on the scene is unclear--and the NHK video did not show them treating victims--but they were there. Even later - Well, that was instructive. I visited Japan Probe and found I was "blaming" EMS workers...for what, the link does not say. In comments (and boy they are not fun to read!) Anonymous #1 says that the TBS broadcast claimed a full DMAT response. "In walking from one end of the country to the other, the voices cry out to me loudly, ‘Please do something about the eldercare insurance system!’ Can we just let the Diet session come to an end like this?" Democratic Party leader Ozawa Ichirō, speaking to fellow members of the DPJ leadership council, as reported in the Yomiuri Shimbun of June 5, 2008, p. 4 . Yes, Ozawa-san and his party could do "something" – they could cooperate with the ruling coalition to craft an emergency compromise bill ameliorating at least some of deficiencies, perceived or real, of the new eldercare insurance system. However, fixing the existing system was not under discussion on Wednesday night. Instead, the leaders of the main opposition party were meeting to decide whether or not to deploy against the prime minister a constitutionally inert chastisement of the government: a House of Councillors censure motion. The sudden revival of a plan to pass a censure motion against the PM in the waning days of the Diet Session is the clearest indication yet that Prime Minister Fukuda has reshuffled the political deck. By going behind the backs of the leadership councils of the ruling coalition parties to unilaterally declare a one year lifespan for the nominally 10 year long plan for road construction finance and by instructing his negotiators to accept Democratic Party-proposed changes to the law on managing the bureaucracy, Fukuda took away the Democratic Party’s biggest electoral cudgel: the claim that Fukuda is "just another Liberal Democratic Party tool of power brokers." Confronted by a Prime Minister willing not only to brush off those in his party intent on reinstitutionalizing patronage politics but also willing to incorporate Democratic Party ideas into legislation (Sound like any other prime minister we know, a recent one, maybe?) the leaders of the Democratic Party have lost their political bearings. The post August 2007 DPJ has relied upon a particular master narrative--that the Democratic Party is engaged in principled resistance against the policies of a ruling coalition beholden to narrow interests, be they foreign (the Bush Administration) or domestic (the road construction lobby, the Ministry of Finance). In the Democratic narrative the LDP-New Komeitō ruling coalition sacrifices the national interest in order to please the narrow interests—and is willing to go even so far as an Article 59 override of the expressed will of the House of Councillors in order to show its loyalty to these narrow interests. "Ergo," the narrative concludes, "we need a House of Representatives election to end the reign of the special interests and restore government for the benefit of the people." Throughout the fall and winter, the ruling coalition has been the stubborn facilitator of the DPJ's political program—seemingly bowing to U.S. pressure to reinstate the mission in the Indian Ocean and clearly kowtowing to the road construction lobby in the gasoline levy and road construction plan bills. Now, however, a new, pliant Fukuda Yasuo (with Cabinet support rates in the 20s, he could hardly be anything else but pliant) seems to have accepted the DPJ's main premise: that the ruling coalition has indeed been too solicitous of narrow interests and must work on behalf of the country—even if that means accommodating DPJ policies. When your political enemy suddenly embraces you and tells you, "I'm sorry, you were right, I was wrong, let's do it your way!" -- you are non-plussed. When your political enemy does the above and you had, in order to build up your wall of political resistance, brought together a gang of fringe elements and kooks whose only commonality was their common enemy—you are in serious trouble. This danger was hammered home last week when the People's New Party announced that it would not longer caucus with the DPJ, the Socialists and the Communists unless those parties united to oppose the nomination of Ikeo Kazuhito to the board of governors of the Bank of Japan. Ikeo had been a supporter of the privatization of the post office, making him utterly unacceptable to the PNP, the party of those expelled from the LDP for their opposition to postal privatization. The loss of the support of the PNP shrinks by four votes the majority the opposition holds in the House of Councillors. It is not enough to throw control of the House of Councillors to the LDP-New Komeito coalition. Since the ruling coalition nominated Ikeo as well, the chance of the PNP will throw its lot in with the ruling coalition is zero. Wrong. The loss of four conservative votes tips the balance of power in the House of Councillors. First, it brings the opposition majority ever closer to the 51% line. This increases the leverage of the Socialists and the Communists vis-à-vis the Democrats, who need the Socialist and Communist votes in order to stop LDP initiatives. Second, the Democratic Party has lost a convenient excuse—"I am sorry, we cannot do ( X) because it is too leftist. It will cause the PNP to bolt from the unified front." – that could be deployed whenever the Socialists and/or the Communists started making demands too left wing for many in the DPJ. Passing a motion of censure against the Prime Minister is the DPJ's way of reassuring the other members of the anti-LDP alliance that the DPJ is not considering accommodation with the LDP. That the DPJ's steadfast opposition to the LDP can be demonstrated without the act being very substantial (though the Communists, ever the legalists in the politics, are wary, wondering, "Doesn't passing a censure motion at the end of the regular Diet session mean that those voting for the motion are also committing themselves to not cooperating in any way with the prime minister in the extraordinary session in the fall?") is icing on the cake. A censure motion also closes the regular session on a down note, reminding the voters (or so the opposition hopes) of how rancorous this session has been...though one would think that reminding the voters via an act of unforced aggression against the PM might prompt some voters to reconsider who exactly was at fault for the turmoil over the last few months. But Ozawa's observation quoted at the beginning of this post points to a more fundamental problem facing the DPJ in the summer and early autumn—the clock is ticking on post-Koizumi LDP bungling. Prime Minister Fukuda has injected new life into his administration by borrowing the Koizumi trick of placing himself between diehard elements of the LDP on one side and the DPJ on the other—stealing the DPJ's thunder without surrending the microphone. Telegenic Koizumi kids, particularly the "Tokyo WOMEN" trio of Koike Yuriko, Inoguchi Kuniko and Sato Yukari—along with the more frail but still startlingly impressive Kawaguchi Yoriko--are shoehorning themselves back into political news stories again. Nakagawa Hidenao, Koizumi's eminence grise at the Policy Research Council, has a new book out on furthering political reform. On Tuesday, to the horror of both his nominal faction leader Machimura Nobutaka (formally on leave from the post because of his service as Chief Cabinet Secretary) and former faction leader Mori Yoshirō, Nakagawa established a new, 33 member pro-growth, anti-consumption tax rise study group, offering an alternative to the Machimura-Yosano Kaoru-Tanigaki Sadakazu mainline bent on wiping out budget deficits through a dramatic increase in the consumption tax. If the Koizumi brain trust has regrouped for a comeback—and after having gone through the Revisionist Radicals, then Ye Olde Wise Men, the LDP only has the Carnival of Nobodies left before it has to go back to the Koizumi Korps—then Ozawa and the DPJ will see their chance at a seizure of power slipping from their grasp. The DPJ has benefited mightily from an arrogant, narcissistic and clueless LDP. Were a general election to be held today, the LDP-New Komeitō coalition would likely fall short of 50% majority in the House of Representatives, forcing the formation an LDP-DPJ grand coalition—if not an outright DPJ-led government. If, however, the prime minister hosts a successful, substantial summit -- and with all the advance work on mega-problems in energy, the rise of the BRICs and global warming there is more than a decent chance the Toyako Summit will be a damned significant one – if the PM keeps relations with the Chinese and the South Koreans on an even keel throughout the testing time of the Olympic Games; and, to top it off, if the PM manages to rein in the worst elements of this own party (through intimidation and a threat of replacing all his current advisors with Koizumi loyalists) then the DPJ will lose its greatest asset: a tin-eared, brick-stupid LDP. For Ozawa, whose knowledge of the score in the long run has always led to carelessness about losing points over inexplicable nonsense in the present, the possibility of the LDP slipping away from its doom once again is unbearable. Better go forth with the censure motion, even at the cost of appearing spiteful. Perhaps the censure motion will cause the PM to lose his cool out of exasperation and hurt (let us not forget the PM's "crying in frustration" episode in the Diet) leading him to govern badly again, precipitating a political crisis. Adding up all the pluses and minuses, it must be worth a try. Yesterday, former LDP Chairman of the Study Group on Fiscal Reform (and Democratic Party leader Ozawa Ichirō best friend) Yosano Kaoru told a Tokyo audience. This has been another edition of Yosano Kaoru bluntly tells folks the ugly facts of life. Tobias Harris writes movingly of last night's speech by Lester Tenney, the last Commander of the American Defenders of Bataan and Corregidor. Kato Kazuyo of Armitage International and, yes, the daughter of the recently retired Ambassador to the United States of the same name, writes what is probably the best review so far of Hu Jintao's trip to Japan. Nice it is to know people in the know. Over at Global Talk 21, Okumura Jun has an excellent analysis up of the current political status of the prime minister, at least according to an exegesis drawing upon the public opinion polls of Fuji Television. Okumura-san indicates that he has his doubts as to one of my recent assertions--that the prime minister can win back some of his lost popularity simply through having a run of good days either through accommodating the opposition in order to pass legislation or, when the lay of land is right, challenging the opposition when it adopts a transparently opportunistic policy stance. Of course the Fukuda administration could always try to win on policy. But I don't think that sweating the small stuff, such as tinkering with the Late-Term Elderly Medical Care Insurance system, is going to have a major impact. I don’t believe that the Hokkaido SG-8 Summit and a squishy agreement on greenhouse gases or any other combination of diplomatic or national security issues are going to be winners either. Okumura-san goes on to speculate that the only policy program likely to attract enough public attention to affect the popularity numbers is the budget agenda-setting reform package scheduled to be tackled in a lengthy extraordinary session in the fall. Given that the number of days until the end of the regular Diet session is growing few indeed, Okumura-san is possibly right. But taking the Fuji Television Cabinet support figures for the Cabinet of Abe Shinzō and comparing them with the Fuji TV figures of the present Cabinet, Okumura-san may be making a fundamental error. The two sets of numbers may not be comparable. The Fukuda Cabinet and the current leadership of the ruling coalition parties are unpopular for failing to understand the mechanics of how to cope with a functioning, if limited, opposition. The people are furious that the ruling coalition has tried to force legislation and appointments, knowing full well that the Democratic Party of Japan and its allies were going to oppose them in the House of Councillors. The voters do not like to see their representatives engaged in contests over who can be the most pig-headed time wasters of all. Abe Shinzō, his Cabinet and his administration became unpopular not because they were ineffective. Quite on the contrary, they became unpopular because they could do whatever they wanted...and they were running amok. b) the readmission to the LDP of the exiles, the Diet members expelled from the party by Prime Minister Koizumi Jun'ichirō for having opposed his plan to privatize the post office. That second priority -- b) -- set off a detonation. The bald move repudiated the imputed will of the people, slapping them in their faces. The people had handed a landslide victory to Koizumi's LDP in the 2005 House of Representatives election...and now Abe was telling the voters that their judgment had been flawed. This was only the first of a series of actions that Abe and his cabal foisted upon the nation not because they were popular or solved particular problems but because Abe and his long-denied fantabulist brothers and sisters finally had their hands on the tiller--and coalition majorities in both House of the Diet. - Education reform emphasizing patriotism and order. - The legal basis for a national referendum permitting amendments to the Constitution. - Mandates, both open and secret, forcing the national broadcaster NHK to feature stories on the abductees at every opportunity. At the same time, real scandals--in the pension system, in the offices of the Minister of Agriculture, Forestry and Fisheries--were left uninvestigated, shunted to the side because the ruling coalition had unbeatable majorities in both Houses of the Diet. Throughout the regular Diet session, the government railroaded every single piece of legislation through. Not one concession was made to the opposition. The voters saw what was happening...and Amaterasu bless them, in July of 2007 they said, "No more of this. You will not do whatever you want. You will have limits on your freedom of action." In his current post, Okumura-san notes that Abe Shinzō's popularity rose with the Cabinet reshuffle in August 2007. What he leaves out is that everyone agreed that the Second Abe Cabinet was a cast of all-stars--far more experienced and moderate than the Cabinet it was replacing, its members far more likely to accommodate a revitalized and now constitutionally relevant opposition. Guess what? For the most part, those all-stars whom both Okumura-san and I hailed-- these are the ministers we have now. The folks inside the ruling coalition just do not get any better--Minister of Law Hatoyama Yukio and the yonyaku, excepted. The reason the Cabinet is unpopular now is that the yonyaku, not the Cabinet, misunderstood and mishandled every bit of legislation and every appointment since September. The yonyaku, trying to rebuild the LDP's relationship with its traditional client base, failed to cut deals with the DPJ, choosing instead to try demonstrate its worthiness through a show of the indomitability of the ruling coalition's will. As if that was what the people wanted. Ever. What the people wanted was for Fukuda to be Fukuda; for Yosano to be Yosano; for Kōmura to be Kōmura; for Masuzoe to be Masuzoe...for the men and women of good intentions and wisdom to work out compromises with the opposition. That is what the Cabinet was expected to do. It is not popular now because its members were not given the chance to run the government based on the political situation--but based on what the grandees of the LDP wanted the situation to be. There has been, all in all, a stunning lack of realism in the actions of the ruling coalition since its wounding in the 2007 House of Councillors election. Hence my feeling that things are on the mend for the prime minister. Just doing what governments do every day--passing nice-sounding but meaningless legislation to cover everyone's backside, accepting legislative amendments proposed by the opposition, calling opposition leaders aside for private talks about potential political appointees, watching the calendar--will be a vast improvement over what we have seen over the last eight months. If Fukuda Yasuo and the members of his Cabinet (pax Hatoyama) can just do government--not revolution, not shock therapy,just government--then there is a chance that the political climate in Nagata-chō could more clement for the PM. There is evidence that Fukuda has at least chucked the "thank you for all your votes at the party presidency election" persona in favor of a "I will keep my own council and if you don't like it you can find somebody else to be your prime minister"--something he should have done in January. Which presages peace and stability until the autumn...when the postponed death of Tanakaism will have to be faced at last...and when the LDP will be forced to look itself in the mirror and decide what it is to become. Later - Apologies for all the typos in the original version of this text. Does anyone know why one cannot search Google News in Japanese ? The Ministry of Law* has released its figures on the number of foreigners residing in Japan in 2007. * Let us stop referring to it as a Ministry of Justice. Let us call it what the original Japanese says it is. Because a national program to protect children from the dangers of the Web and mobile telephony is like soooooooo last week. Fresh from a globe-girdling brouhaha over the prime minister's education revitalization panel's highlighting of the dangers that unsupervised use of Internet-enabled mobile telephones pose for elementary and middle school children, the ruling and opposition parties put aside their mutual disdain for one another yesterday (June 2) in order to agree to pass a bold new law...that will not create national standards for Internet content. In a non-partisan show of their mounting concern, the parties have agreed that third parties (corporate-NPO partnerships) -- and not the Government -- should craft recommendations for manufacturers on how to improve their technology for filtering the content of websites and text communications. Furthermore, to demonstrate their determination to protect the children of Japan from the threats posed by the new communications technologies, the ruling and opposition parties agreed that the legislation mandate the installation of filtering software in all new communications and web access devices. It will also require that operators of servers comply with the development of means to prevent children from accessing sites deemed harmful. Non-compliance with these new, strict regulations will carry no penalties, of course. Could they have not at least waited a little while longer before showing their actual lack of concern regarding this latest inflated social crisis? There was hardly enough time for the television networks to put together the usual hailstorm of half-hour reports on the various ways the Internet is corrupting and killing people. By agreeing to pass a toothless law just before the expiration of the Diet session, it is as though the entire political class were trying to establish new national standards for...blasé insincerity. ...out the door just when the competition for their services heats up. TOKYO, June 3 - Skymark Airlines (9204.T: Quote, Profile, Research), a discount domestic carrier, will cancel 168 flights in June due to a shortage of pilots, sending its shares to their lowest level this year. The shortage comes after two pilots retired at the end of May, and the cancellations account for about 10 percent of all its scheduled flights this month, affecting four routes and about 9,000 passengers, Skymark said. "With the absence of two pilots, we could expect some unexpected flight cancellations, and we decided it would be better to cancel them ahead of time to limit further problems for our customers," said Skymark spokesman Shuichi Aoyama. He said it was still unclear whether its flight schedule would go back to normal in July. Skymark said it was in the process of switching all of its fleet from Boeing 767 aircraft to smaller and more fuel-efficient Boeing 737 aircraft by 2010, but the two pilots who retired had licenses for the 737. Thus, ladies and gentlemen of the jury, did the Asia-Pacific cage fight for talent and skills begin. Last week the Prime Minister's advisory group on education revitalization caused quite a stir by advocating a public education program discouraging the use of mobile telephones by elementary and middle schoolchildren. Prime Minister Fukuda Yasuo was asked in his daily news gaggle his opinion of the recommendation. "It is a fact that there are also harmful effects from the possession of mobile telephones. They cause many kinds of problems. It is necessary for parents to carefully consider whether or not it is good to give mobile phones to children. It is necessary for society to take an interest in the question of whether or not the carrying of mobile phones has a purpose in childrearing." Wire services and publications around the world carried the story, lured by the heady mixture of the seeming hopelessness of trying to crack down on access to wireless communications, overblown reporting of crimes against and by children abetted by the new technologies, latent technophobia and the ubiquity of mobile telephony. A few mentioned another recommendation, that children start English language education in the third grade. In their reports, the news services referred to the authors of the recommendations as a government panel or government advisory council. A lot jumped the gun, saying that limiting access to mobile phones was a new government program. It likely will never be. In a furious op-ed entitled "Education Revitalization: Their Feet Don't Reach the Ground" (Kyōiku saisei: chi ni ashi ga tsuite nai no de wa) the editors of the Mainichi Shimbun last Tuesday asked, quite seriously, "Who are these people making these idiotic recommendations in the name of revitalizing education?" It turns out that the Commission on Education Revitalization (Kyoiku saisei kaigi) -- the advisory council organized by Prime Minister Abe Shinzō which set out to and did produce a blueprint for toughening up the yutori (slack) education curriculum and the new, some say anti-union, standards for ensuring teacher quality -- quietly, without any fuss, closed up shop earlier this year. In its place Prime Minister Fukuda appointed similarly-named Roundtable on Education Revitalization (Kyoiku saisei kondankai). Unlike the Commission, though, the Roundtable has no clear mission: it is not required to produce a report; it does not seem to have a particular problem or set of problems to tackle. Continuous improvement of education, as the Mainichi editorial points out, is the remit of another, well-established advisory group: the Central Education Council (Chūō kyōiku shingikai). So what the heck is the Roundtable on Education Revitalization for? It seems to be simply a talk shop, its members commenting on whatever they want to comment on. Without considering the consequences or implications of their recommendations. Just what one would need to make an evisceration of politician-driven policy change all the more complete. Why is Fukuda allowing this regression? Is Japan suffering from a surfeit of reformism and/or a dearth of pie-in-the-sky dreaming, making it necessary to deprofessionalize the adjunct advisory councils to the prime minister? As for Decentralization Reforms, May the Government Show the Ultimate in Respect Toward the Recommendations! The title, as far as I can figure, of Friday's Yomiuri Shimbun editorial admonishing the government and the people to take the first set of recommendations of the Commission for for the Promotion of Decentralization Reforms (chihō bunken kaikaku suishin iinkai - council chairman: Itochū chairman Niwa Uichirō) as seriously as humanly possible. Yes, there is a reason why I call it "Pravda by the Palace." As for the recommendations of the Commission, a cursory glance indicates what seems to be way too much promotion of decentralization and damnably little commitment to reform. Later - For an example of what I mean by "way too much promotion of decentralization..." to the possible detriment of actual reform and popular welfare, here's my take on one of the recommendations lauded in the above-mentioned editorial. I do not have much to say about the Yoshida Brothers. Only that they have made a welcome effort to make the shamisen cool, frenetic and contemporary. Why have Japanese musicians have found it so hard to incorporate traditional instruments into modern musical composition? China's composers, both classical and contemporary, seem to have had fewer problems insinuating qiu and other traditional instruments into modern compositions—or in using the traditional instruments alone for performances. Part of the problem is that traditional Japanese string instruments are plucked rather than strummed or bowed. However, the technique aspect cannot be the whole of it, for Indian and Pakistani contemporary music is rich with plucked sounds. Of course, it might take an age to undo the damage wreaked on the nation's musical senses by enka orchestration. Moody lighting and young dudes can help bridge the gap, as one can see in June's song "Kodō" by the Yoshida Brothers, on YouTube here. Shisaku will be suffering some teething pains over the next few days as I fiddle with the various elements of the redesign. I apologize that the new template, a variant of Blogger's "Minima Lefty," seems to have problems acknowledging some simple formatting commands. In particular, it is refusing to return the main body of text to the default double spaced mode following the inclusion of a blockquote or a photograph. Comments, suggestions and potential HTML fixes to the template are all welcome. Contact can be made either via the comments section or the new email address. Later - Reader PW has mailed a snippet of HTML fixing the problem. All hail Reader PW!